SEOUL – A senior US diplomat said it was up to individual countries to decide on joining a new China-led international development bank, as media reports said a growing number of close US allies were ignoring Washington’s pressure to stay out of the institution. France, Germany and Italy have agreed to follow Britain’s lead and join the Asian Infrastructure Investment Bank (AIIB), a major setback for Washington, the Financial Times reported. In China, the state-owned Xinhua news agency said South Korea, Switzerland and Luxembourg were also considering joining. The Financial Times, quoting European officials, said the decision by the four countries to become members of the AIIB was a blow for Washington, which has questioned if the new bank will have high standards of governance and environmental and social safeguards. On Tuesday, Washington’s top diplomat for east Asia signalled that the concerns about the AIIB remained, but the decision on whether to join was up to individual nations. “Our messaging to the Chinese consistently has been to welcome investment in infrastructure but to seek unmistakable evidence that this bank…takes as its starting point the high watermark of what other multilateral development banks have done in terms of governance,” US Assistant Secretary of State for East Asian and Pacific Affairs Daniel Russel said in Seoul. “Every government can make its own decision about whether the way to achieve that goal is by joining before the articles of agreement are clarified or by waiting to see what the evidence looks like as the bank starts to operate,” he told reporters. 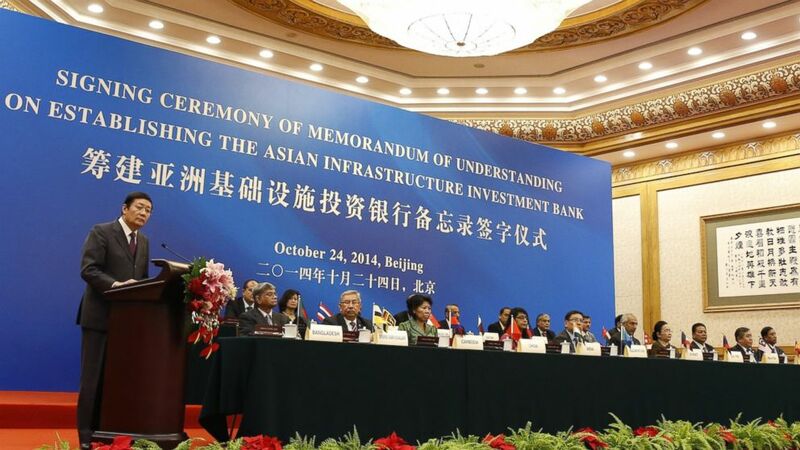 The AIIB was launched in Beijing last year to spur investment in Asia in transportation, energy, telecommunications and other infrastructure. It was seen as a rival to the Western-dominated World Bank and the Asian Development Bank. China said earlier this year a total of 26 countries had been included as founder members, mostly from Asia and the Middle East. It plans to finalise the articles of agreement by the end of the year. Japan, Australia and South Korea remain notable absentees in the region, though Australian Prime Minister Tony Abbott said at the weekend he would make a final decision on AIIB membership soon. South Korea has said it is still in discussions with China and other countries about its possible participation. Japan has the biggest shareholding in the Asian Development Bank (ADB) along with the United States and the Manila-based bank is headed by a Japanese, by convention. Japan is unlikely to join the China-backed bank, but the head of the ADB, Takehiko Nakao, told the Nikkei Asian Review that the two institutions were in discussions and could cooperate. “We’ve begun sharing our experience and know-how,” Nakao was quoted as saying. “Once the AIIB has actually been established, it’s conceivable that we would cooperate,” he said. China has said nations could join as founder-members of the AIIB until March 31, and that Japan was included in the invitation. Australia faces becoming more isolated in the US-led battle to curtail the power of China’s new specialist infrastructure lender with more European countries now set to join the US$50 billion institution. France, Germany and Italy have all reportedly agreed to follow Britain’s lead and join the Asian Infrastructure Investment Bank (AIIB), according to European officials in a major blow to the US efforts to discourage western countries from joining up. The decision by the three European governments reported by the Financial Times comes after Britain announced last week that it would join the bank sparking an unusual rebuke from US officials who are concern the Chinese bank will undermine development governance procedures. Last year the federal government split over whether Australia should be a foundation member of the bank with Prime Minister Tony Abbott and Foreign Minister Julie Bishop heeding the US opposition while Treasurer Joe Hockey and Trade Minister Andrew Robb argued Australia should be on the inside of an important new regional financial institution. But this week Mr Abbott and Ms Bishop have both indicated the government is reconsidering its opposition after comments by Mr Hockey last week. Meanwhile Asian Development Bank has suggested that it may cooperate with the AIIB but wants it to adhere to international standards of conduct, ADB President Takehiko Nakao told Nihon Keizei Shimbun in an interview on Monday. Mr Nakao said the ADB – which is traditionally led by Japan – had received inquiries from China about rules for bidding on infrastructure projects, procurement methods and other subjects. “We’ve begun sharing our experience and know-how” with the Chinese side, he said in his first detailed comments on the AIIB. The ADB has taken a low key position on the potential competitor from China, while the World Bank and the International Monetary Fund leaders have been more supportive of the new institution as long as it applies the same governance standards as other international agencies. Meanwhile US Council on Foreign Relations senior fellow Elizabeth Economy has called on the Obama Administration to end its campaign against the AIIB and try to influence the institution’s development by joining it. “There is no sense expending further political capital trying to persuade regional and other actors not to join the bank. It is a small-potato issue that is making the United States look weak at a time when US influence in the region is otherwise quite strong,” she said.